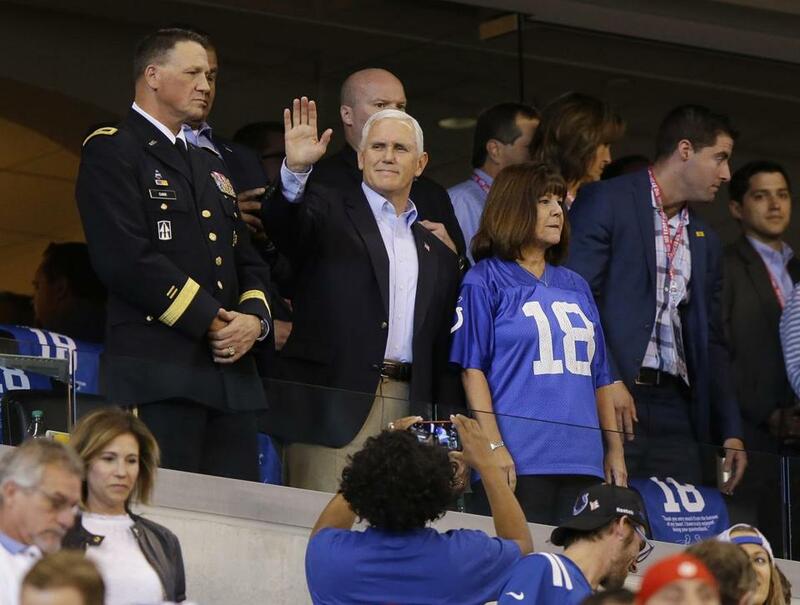 Vice President Mike Pence waved to fans before an NFL football game between the Indianapolis Colts and the San Francisco 49ers. WASHINGTON — President Trump reignited his feud with the NFL on Sunday by telling Vice President Mike Pence to walk out of a game in his home state of Indiana after nearly two dozen players from the visiting San Francisco 49ers knelt during the playing of the national anthem. While the vice president portrayed his decision as a gesture of patriotic principle, it had the distinct appearance of a well-planned, if costly, political stunt. He doubled back from a trip to the West Coast to take a seat in the stands in Indianapolis, where the 49ers — the team most associated with the NFL protest movement against racial injustice — were suiting up to play the Colts. For Trump, the vice president’s walkout keeps alive a dispute that has proved popular with his political base, even if he has drawn criticism from the NFL and some of its owners for being divisive and politicizing professional sports. On Sunday, a spokesman for the NFL, Joe Lockhart, declined to comment. Some criticized Pence’s walkout as transparently premeditated. The vice president did not take a pool reporter traveling with him into the stadium; a member of Pence’s staff told the reporter that the vice president might be leaving the game early. “Manipulation of faux patriotism took new turn today with VP Pence. Preplanned early exit from Colts game after 49ers kneeled, then tweets,” Norman Ornstein, a resident scholar at the conservative American Enterprise Institute, wrote on Twitter. Others pointed out the expense involved: Pence flew to Indianapolis from Las Vegas, where he had attended a memorial service for victims of last Sunday’s mass shooting, and was immediately flying back to Los Angeles.